Oh MacBook Pro, how we’ve missed you. It’s been four long years since Apple issued the last major overhaul to its high-end laptop line. Four years of waiting for some big announcement from the company, as laptop hinges loosen, trackpads go wonky, the screen laminent starts to lose its luster. For those who have been holding out since 2012, the day, as expected, is finally here. Tim Cook took to the stage today at an intimate event at Apple’s home ship in Cupertino to show off what the company has been working on all this time. On the 25th anniversary of the release of the company’s first notebook (the PowerBook), the company showed off the newly refreshed version of the Pro, featuring, as leaks suggested, a secondary display between the keyboard and screen. 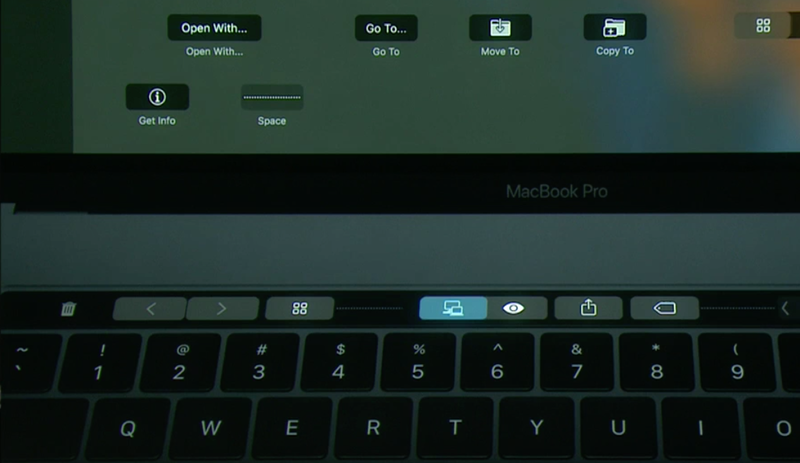 Apple has christened it Touch Bar (sorry, Magic ToolBar fans), the mini Retina display that does away with the Mac’s row of function keys. The space is a small multitouch screen (with support for up to 10 fingers at once) that utilizes gestures and taps to perform a wide variety of tasks, from showing typing suggestions to displaying tools for various apps — all based on the context of what the user is doing at the time. The company showed off a few of the different adaptive functionality sets — primarily tuned to the company’s own software offerings at the moment, though the company did offer a sneak peek of functionality with key partners like Adobe PhotoShop and Algoriddim’s djay Pro (with support for Word, Excel and PowerPoint on the way, as well). Click into photos and you get a slew of editing tools like cropping, photo straightening and alignment, and in video editing, you can use the space to scrub timing back and forward with a swipe. This wouldn’t be a piece of Apple hardware without Siri built-in. There’s a button available by default that will bring you directly to the company’s friendly AI assistant. Oh, and unlike the iPhone’s headphone jack (there’s still one here, don’t worry), the function row isn’t completely dead. There’s a function button that brings all the keys back when you hold it down. Users can also customize the bar by dragging and dropping functionality down from a Notification Center-like pane that pops up from the bottom of the screen. 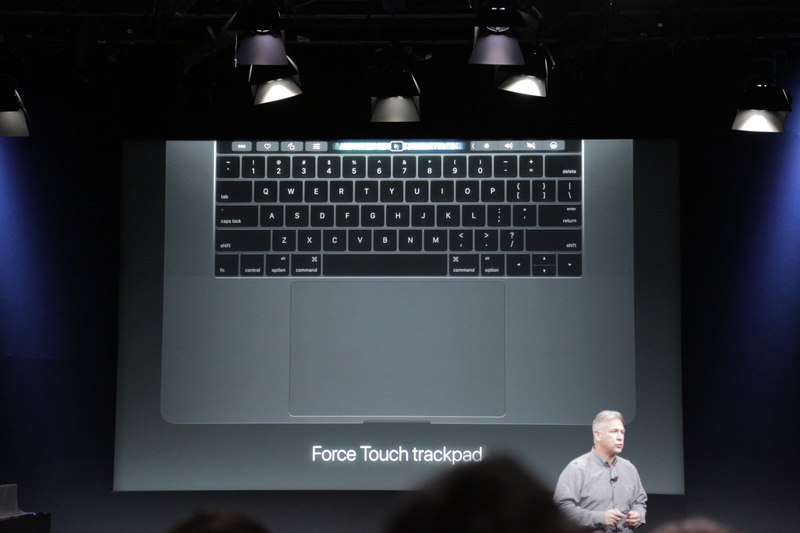 The bar also includes TouchID, which utilizes the new Apple T1 chip for security. 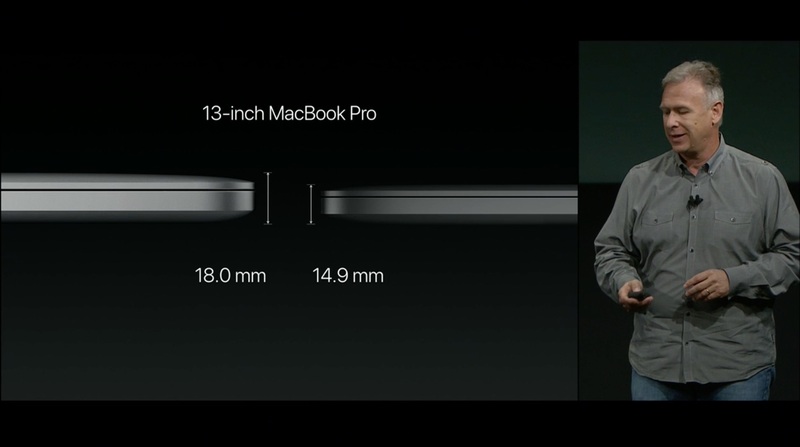 According to the company, it’s the thinnest and lightest version of the Pro to date, with the 13-inch version of the laptop measuring in at 14.9mm thick, making it 13 percent thinner than the Air. The 15-inch version of the notebook weighs in at four pounds and the smallest 13-inch version comes in at three pounds. As for the rest of the hardware, Apple’s souped up that as well, after its prolonged break. The 15-inch version of the laptop features a 67 percent brighter display with 67 percent higher contrast and a color gamut that’s a quarter brighter than its predecessor. That’s coupled with some improved speakers for the system, as well. Inside you’ll find Intel Core i5 and i7 chips cooled by a new thermal architecture that promises to be quieter and lessen system overheating — both issues found in previous versions of the laptop. According to the company, graphic performance has been improved, with speeds up to 130 percent faster than the last model (that’s the 15-inch again). Outside, you’ll find four Thunderbolt 3 ports, all of which can be used to charge the system (so long, MagSafe). Using adapters, they can also double as USB, DisplayPort, VGA or HDMI — so, get ready to pack some extra cables. And if you really want to go crazy, you can use the 15-inch version to run two 5K displays side by side. And yes, the headphone jack is still there, no adapter required (for now). 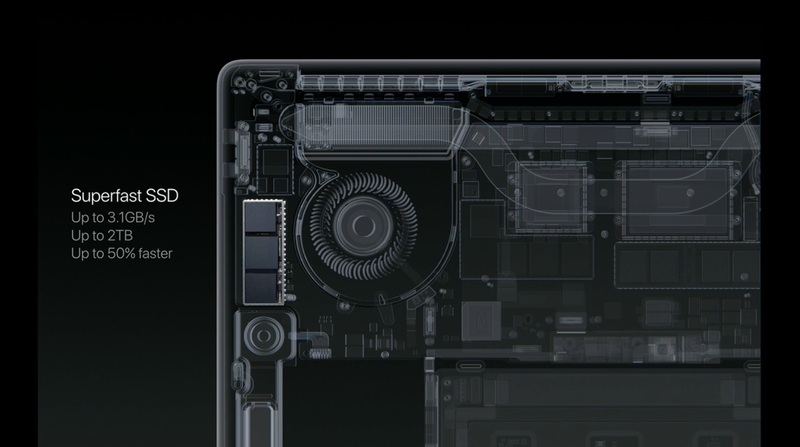 The trackpad is now double the size of the latest version and includes the Force Touch feature included on the standard MacBook. The keyboard has been updated, as well, to include the “butterfly” keyboard switch mechanism also seen on the most recent MacBook (I wasn’t a huge fan when I used it, but like any new keyboard, it takes getting used to). The new Pro is available for order now. It’s priced at $1,499 for the 13-inch version with standard function key version and $1,799 for the version with Touch Bar. $2,399, meanwhile, will get you the 15-inch version. The entry-level starts shipping today; the others will follow in two to three weeks.